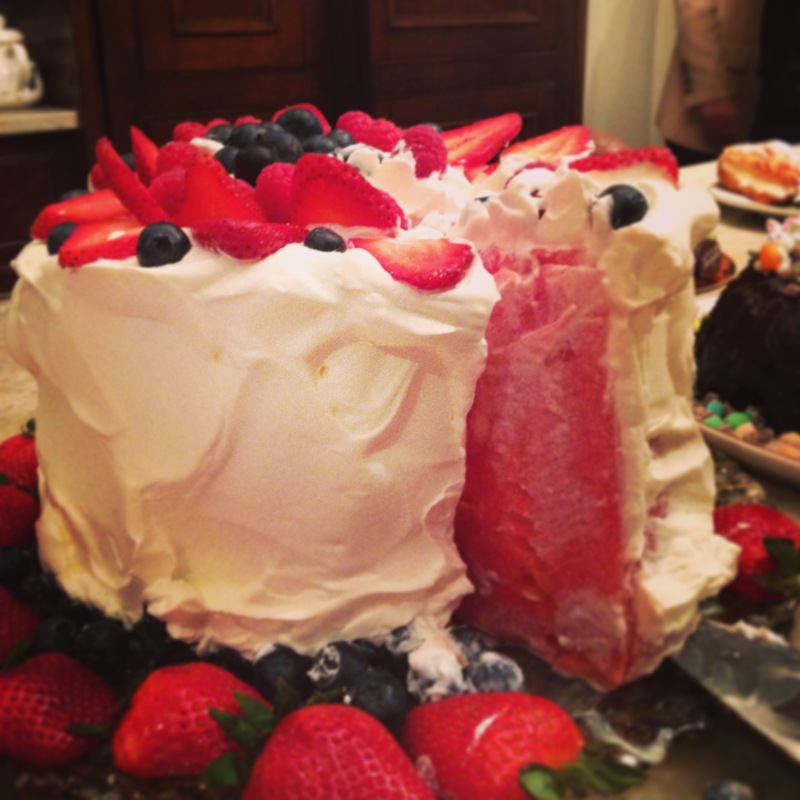 This year, my contribution to the Easter festivities was a Watermelon “cake”. It’s not really a cake…although it looks like just like one. Its a solid piece of watermelon on the inside, deceptively decorated. I found this recipe on Pinterest a couple of weeks back and it really intrigued me. I thought it was so clever and just had to try it. However, I slightly suspected it would flop. I thought there’s no way the whipped cream frosting will stay on but it did! My leftovers were pretty good-looking even the next day! Although, since its so quick and easy to prepare, I would make it the same day as my event. For one thing, I find that once berries are washed, they don’t look as fresh the next day. 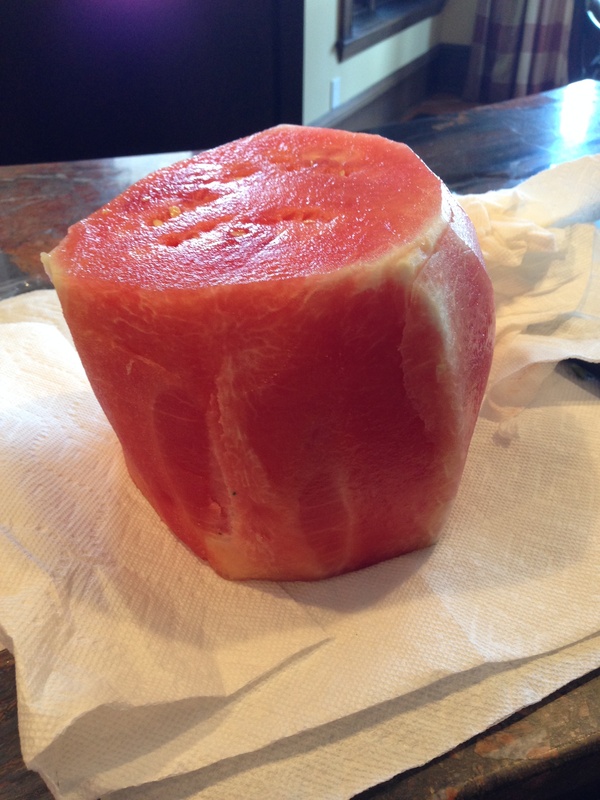 1 Evenly shaped, large Watermelon, seedless preferably but it doesn’t matter if it’s not. 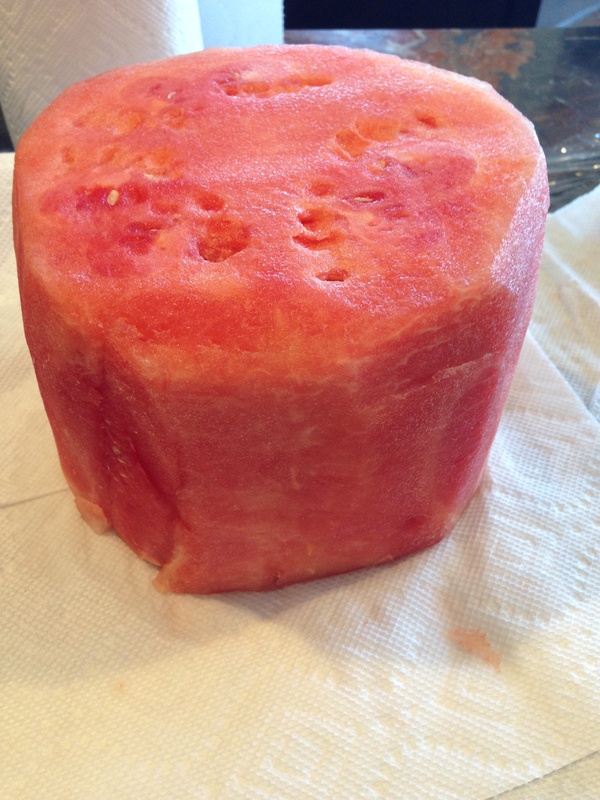 Simply cut off the round ends of the watermelon. You will be left with a cylinder. Stand it up and cut the centre out of the rind. Discard the skin / rind. 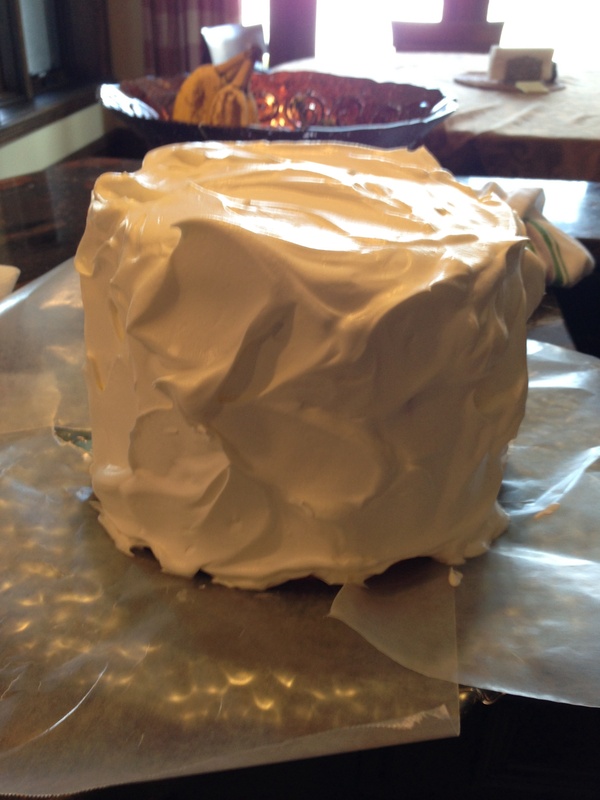 Shape it with a knife, perfecting, removing any sharp edges and white parts. Blot it (dry it off) with paper towels. 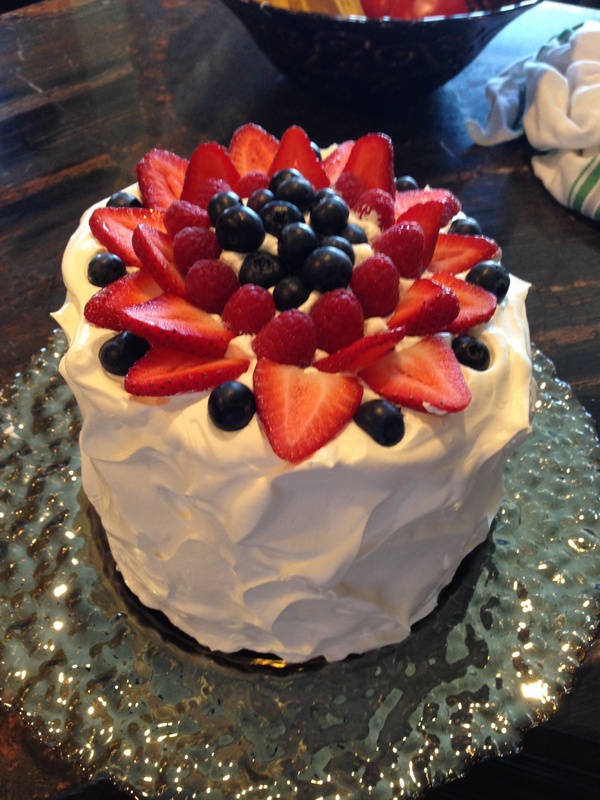 Do it once all around, wait and do it again just before you frost with the whipped cream. 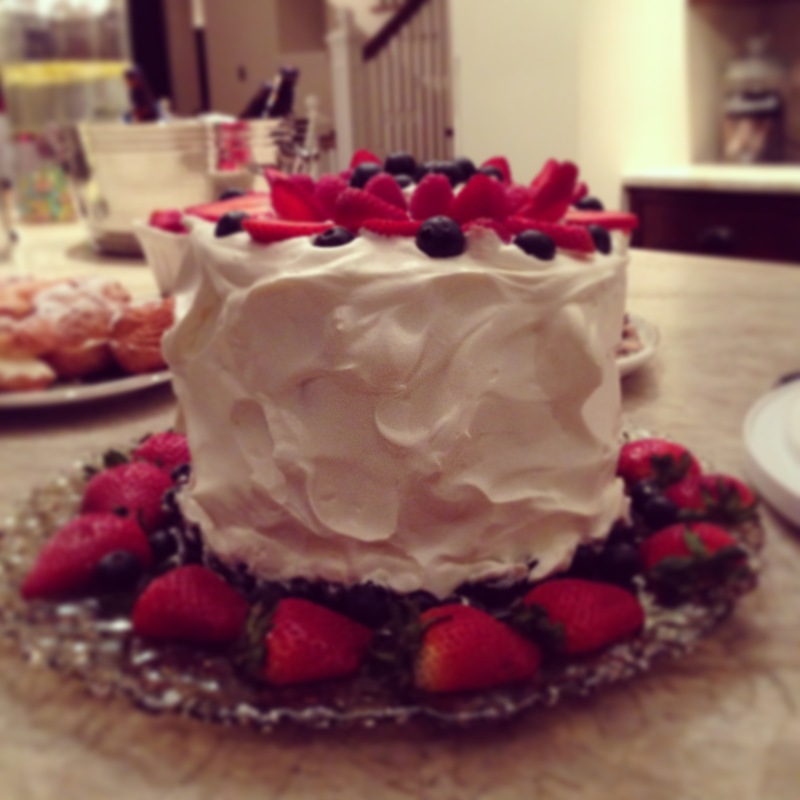 Frost with sweetened *whipped cream, top with berries and voila! 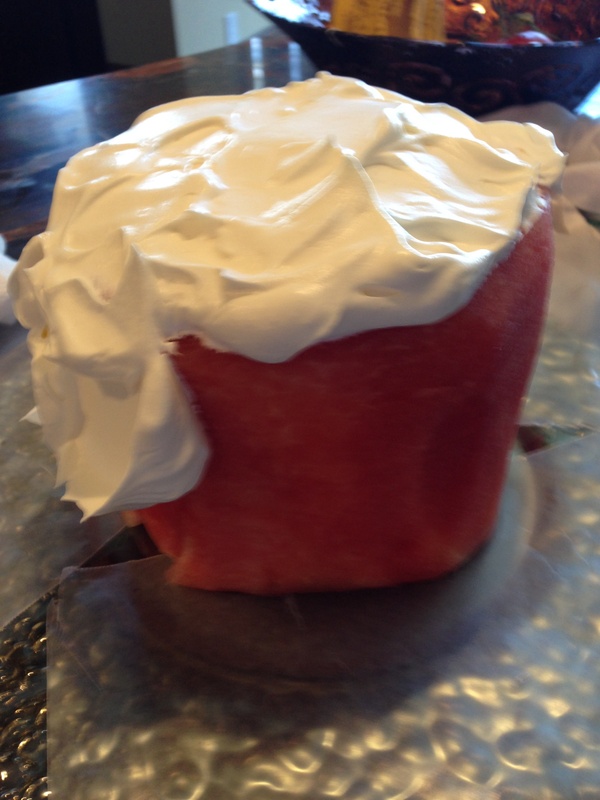 *The whipped cream will not slide off provided that your cream is nice and firm and your watermelon was sufficiently blotted. **I have discovered those hassle-free frozen tubs of Cool-whip. It’s perfectly whipped and sweetened. Nutriwhip works out great and its lactose free but tastes slightly synthetic and too sweet. Whipping your own cream is ok too. Just make sure it’s whipped until you have stiff peaks and if you flip your bowl over, it shouldn’t move. Nope! Tapping it is not the way. If it is a buttery yellow color, then it was picked at the right time meaning that the flavor and ripeness should be right. If the spot is green or white-ish that means it was picked prematurely and may lack in flavor and is not ripe. If it’s a dark yellow – it’s probably overripe and too watery for this recipe. Try it out at your next get-together!